Each person has his or her own idea of what his or her house should be. Some people like the Russian uniqueness, some people - German rigor, some people - European laconism, and some people want to create something of their own, special. That is why the construction of any house begins with the design. Designers of the Finnish House company understand as nobody that each person is individual, and design of any object begins first of all with understanding of features of the customer's and his family's life . The availability of in-house engineering Department. Many years of experience in designing houses made of laminated veneer lumber. 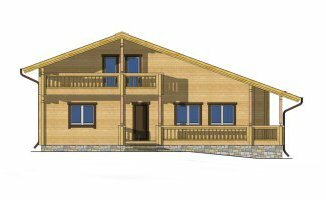 As per of design of our architects, more than 50 houses made of laminated veneer lumber were built only in Primorsky Krai. Knowledge of all technological details of production and construction of houses made of laminated veneer lumber. Consultations at any stage of construction. Topographic plan of the site, urban plan (if available). In the projects catalog of the Finnish House company you can choose ready-made projects of houses made of laminated veneer lumber, which have already been built or are currently under construction. Any of these projects can be corrected for your wishes and features of your land, but the most correct way to build your home is to develop an individual project. During the conversation with the customer, terms of reference for the development of a basic design is drawn up. Next, the architect creates the first graphic materials that give an idea of the space - planning structure of the future house, the location of the house on the site. After a detailed discussion with the customer and corrections, a detailed three-dimensional model of the house is created. Making up a model allows you to fully assess the future structure and discuss with the customer any detail of the object. This design stage lasts for 3-4 weeks. After approval of the basic design, the company's specialists begin to develop working documentation. The number of sections developed at this stage depends on the complexity of the object and must be agreed with the customer. This stage of design lasts for 1-5 weeks and the obtained materials are the basis for calculating the cost of the basic set of the house. At the end of the design work, a complete set of working documentation is formed, approved by the customer and transferred to the production. the project in advance takes into account all shrinkage and small deformations, which are inherent in any wooden house. Construction and design of frame houses and houses made of laminated veneer lumber.